You are here: Home › Blog › We are the company that moves whole houses. 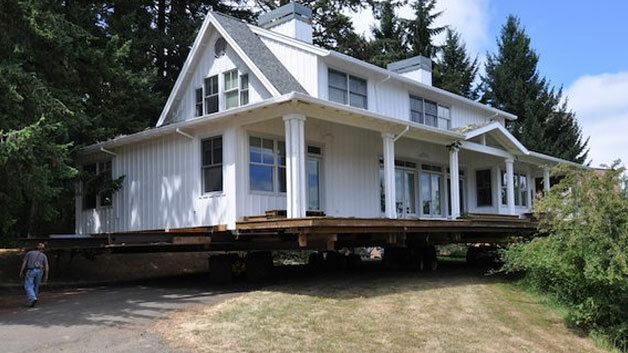 At Kunkel Moving and Raising we take pride being the company that moves whole houses in Western Washington. For 103 years we have pioneered the whole house moving industry in the Pacific Northwest, inventing many techniques that have increased safety, and efficiency. The result has been lowered risk for our customers as well as lowered cost. While we are not the only company that moves whole houses in Washington State, we are the oldest and most experienced. Our organization predates institutions like McDonalds and Toyota, and we have 4 generations of knowledge behind every move we perform. You can count on Kunkel Moving and Raising providing a first class experience from the initial lift, to the final placement on your new property. You will see why we are the top-rated company that moves whole houses in the Seattle, WA area. We are not the largest company that moves whole houses – we don’t have to be! We are a small but extremely efficient house moving company. All of our employees have specialized house moving industry specific knowledge that is crucial to each job we do. We take a personal interest in each house we move, because each situation is unique. Our customized, holistic approach has proven time and time again to be in the best interest of our customers. As your local company that moves whole houses, we gladly provide free consultations. While moving an entire house to a new property is often a great investment there are times when it is not. We will give you an honest cost analysis so that you as the homeowner can make the best decision for yourself and your family. When you think of a company that moves whole houses we want you to think of Kunkel Moving and Raising. No matter what your whole house moving needs, please feel welcome to contact us at any time for information.